Time is money in the construction industry. Subsurface Imaging, Inc. saves you both. The speed at which we schedule our work, the quality of work we produce, our focus on safety, and our commitment to providing personal client service set us apart from our competitors. When your project requires drilling concrete, time is of the essence. You don’t want your schedule compromised because you have to wait to find out what’s inside the concrete. We take great pride in our lightning-fast turnaround times. Within 72 hours (and very often within 24) you’ll know exactly what’s inside your concrete, so you can move forward with your project as scheduled. It’s nice to know there is material in your concrete, but this knowledge is of little value if you don’t know what it is. Is it plastic conduit? Rebar? Post-tension cable? We utilize state-of-the-art X-ray technology to show our clients what’s inside the concrete. We eliminate the guesswork, which saves you the headache caused by finding out that what you thought was harmless…wasn’t. If a client’s project doesn’t require X-ray, we can also provide Ground Penetrating Radar (GPR) and utility locating services. Learn more about the services we provide. Subsurface Imaging, Inc. holds a radioactive materials license that requires strict adherence to safety guidelines. The company is licensed by the State of California Department of Health, Since California falls under the purview of the Nuclear Regulatory Commission (NRC), we are permitted to perform our services in other states as well. Our X-ray equipment is licensed by the state of California, and our GPR equipment is registered with the Federal Communications Commission (FCC). In addition to all the regulations the company follows, they also employ well-trained and fully-certified technicians that understand the importance of safety. You can rest assured that when you partner with Subsurface Imaging, Inc. your project is in good hands. How often do you see the owners of any company working side-by-side with their employees? 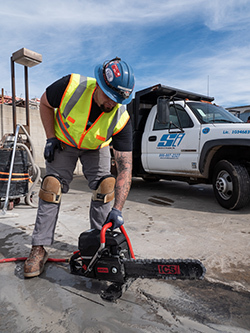 The owners of Subsurface Imaging, Inc. are dedicated to providing excellent personal client services, and they are known for arriving on job sites to ensure their clients are receiving the highest quality services possible. If clients have any questions or concerns, no matter how small, and no matter what time of day or night, the owners, Jody (310-877-4431) and Jamie (714-322-1721), are only a phone call away. We look forward to showing you why we're the ideal choice for your next project. Please contact us to schedule your project or to learn more about what we can do to save you time and money.